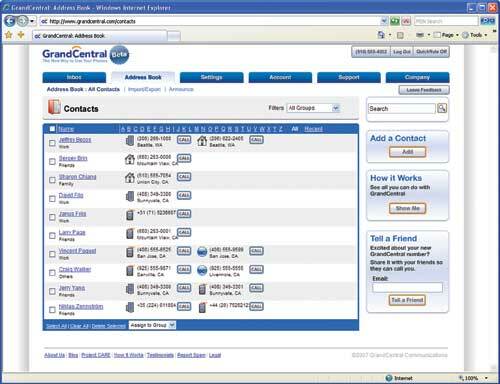 GrandCentral is a new and exciting telco/Web 2.0 service. Created by Craig Walker (ex-CEO Dialpad Communications) and Vincent Paquet (ex-Director of Business Development at Yahoo! ), their new service offers users a way to take some serious control over their “tele-identity.” GrandCentral boasts a myriad of features that would surely cost a mint if provided by a conventional telco/cellular provider. Keep one phone number that follows you, and not a device or a service. Then assign up to six existing phones to your single GrandCentral number. Once all your phones are assigned, you can answer that number with any phone set up under your account. For example, when someone calls your GrandCentral number, all of your configured phones ring at the same time. You pick up one of your phones, the others stop ringing. Get this: you can switch phones (mobile battery almost dead?) during mid-call. You can screen a voicemail as it is being made, and you can even jump directly into the live voicemail if you need to. Believe it or not, this service is free (with the exception being able to make outgoing calls via your GrandCentral service account page or from your service voicemail directly). It should be noted that you still have the capability of making normal outbound calls from each phone, of course, adhering to each phone’s service limitations, respectively. I don’t know about you, but I think that this is really cool stuff. When you sign up for service, you request a preferred area code/city locale, set up a PIN for access to your voicemail, then add phone numbers to your newly assigned GrandCentral number. After your phone numbers are added, you can start receiving calls. Trust me, its a little weird to have all your phones ring at once, – so be ready for that. You can even configure your daily schedule so that your GrandCentral number only rings to certain locations when told to do so – i.e. configure your service to only ring your home during the hours of 6:01pm to 7:59am. All voicemails are saved online so you can get to them from anywhere via phone or the Internet…you can even record phone calls (I think this could be a good or a bad thing, right? ), which are also stored online. GrandCentral’s service is currently in beta, and new memberships are granted in a similar fashion as Google’s GMail when it was introduced (in other words: “invite only”). However, I discovered if you reserve a number now, you just might get a beta invite after a few days of waiting. GrandCentral supports Project CARE, a service which provides a free means of communication for the homeless (currently, offered to the San Francisco area only). A service such as this can help people get their lives back together, making it possible for them receive voicemail from family, potential employers, social workers, or other contacts. This is a great cause, and I think it’s awesome that GrandCentral supports it. We need more organizations like this. Yikes. My guess is that GrandCentral will upstage (and perhaps in the future directly compete with) EBay’s Skype service. GrandCentral’s core is strong, their beliefs are charitable, and their ideas are innovative. The number of features are, in a word, astounding. I still find it hard to believe that GrandCentral can offer this as a free service (outbound calls via Internet inbox/voicemail notwithstanding). This really might be a Web 2.0 service that actually lives up to and possibly even exceeds the hype. ‹ [GAS] “How to” Contest – Only 24 hours left! I use Grand Central and LOVE it. I pay for no long distance calls now and have replaced my $50 monthly cell phone bill with a cheaper home phone and my work phone. If I go away anywhere, I can have all my calls forwarded to that number where I will be. You think the IPhone voicemail is cool? Well that is what Grand Central's is like. Lots of really cool features and my friends get freaked out because when they call me, each has a unique greeting that I designated for them. When my mom calls, she hears a voice mail that says "Hey mom, I can't get to the phone, leave a msg or not, I know you've called now". Plus, the ringing they hear can be unique for each of them too. I have friends in England who call the number and now, when they hear the ringing, it is the British ringtone they hear, not the American one. I had a friend who spent a year in Japan and now that he is back, I set it up for him to hear a Japanese ringtone when he calls me so it makes him feel like he is back there. You think the IPhone voicemail is cool? Well that is what Grand Central’s is like. Lots of really cool features and my friends get freaked out because when they call me, each has a unique greeting that I designated for them. When my mom calls, she hears a voice mail that says “Hey mom, I can’t get to the phone, leave a msg or not, I know you’ve called now”. I'm totally stoked about using this service… It is good to hear that you are loving it – goes to show that we have some readers that are already "in the know" and have run the tires off of it! I’m totally stoked about using this service… It is good to hear that you are loving it – goes to show that we have some readers that are already “in the know” and have run the tires off of it!